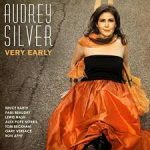 There’s immediate comfort in encountering Audrey Silver’s music for the first time. Her voice is an open invitation, an instrument of confession and creation that immediately transports you to someplace else. That’s evident from her first utterances through her last words on Very Early. In putting together this program, Silver thought long and hard about song selection. It shows, both in the eclectic playlist she created and through the unique arrangements born of her thoughts and Steven Santoro’s clever pen. Everything from overdone Broadway favorites to original material to jazz standards sounds fresh in these interpretations. Irish singer-songwriter Declan O’Rourke’s “Galileo” provides a gentle entryway into Very Early, with pianist Bruce Barth‘s woolgathering serving as a dreamy introduction. Silver then settles in to tell the tale of a wrestling match between emotion and intellect in the titular figure, never underselling the lyrics or overplaying the heart, and it proves to be one for the books. Then there’s a spin through “Surrey With The Fringe On Top” in five, a riveting original collaboration between Silver and Dominique Gagné dubbed “The Cold Wind’s Embrace,” and a shadowy take on “Getting To Know You” that’s more a tale of lurking and voyeurism than a sign of positive personal discoveries. Smart writing, twists in intention, and big-picture talent play as one in these first selections and the music that follows.